I am currently reading Book of Dust: La Belle Sauvage by Philip Pullman which was published today (19 October 2017). It feature Eleven-year-old Malcolm Polstead and his dæmon, Asta, who live with his parents at the Trout Inn near Oxford. When not working at the Inn Malcolm enjoys navigating the River Thames using his beloved canoe, (a boat by the name of La Belle Sauvage). Opposite the Trout Inn is the Godstow Priory where the nuns live. On one occasion Three important customers, one of whom is Lord Nugent the Ex- Lord Chancellor of England, visit the Trout Inn. Malcolm finds himself drawn into an exciting adventure When, While out on his canoe on the canal, he witnesses a chap being arrested by two members the mysterious and sinister Consistorial Court of Discipline, who work alongside the Church. So Malcolm investigates and discovers a small object with a secret message inside it concerning something called the Rusakov Field and Dust. Malcolm then gets a shock when the same two men later turn up at the Trout Inn and start asking pertinent questions about the three men who had visited earlier and arrest a local named George Boatwright. Things get even more mysterious when Malcolm learns that The chap who was arrested was a scholar at Magdelane College named Robert Luckhurst who later turns up dead in suspicious circumstances after an apparent accident. Malcolm also learns that Godstow Priory is looking after an infant called Lyra Belacqua who is the child of a famous explorer named Lord Asriel and is part of a mysterious prophecy.. Satirist, essayist, poet and cleric Jonathan Swift sadly passed away on 19 October 1745 (aged 77), shortly after having a stroke. He was born 30 November 1667. He is remembered for works such as Gulliver’s Travels, A Modest Proposal, A Journal to Stella, Drapier’s Letters, The Battle of the Books, An Argument Against Abolishing Christianity, and A Tale of a Tub. Swift’s family had several interesting literary connections: His grandmother, Elizabeth (Dryden) Swift, was the niece of Sir Erasmus Dryden, grandfather of the poet John Dryden. The same grandmother’s aunt, Katherine (Throckmorton) Dryden, was a first cousin of Elizabeth, wife of Sir Walter Raleigh. His great-great grandmother, Margaret (Godwin) Swift, was the sister of Francis Godwin, author of The Man in the Moone which influenced parts of Swift’s Gulliver’s Travels. His uncle, Thomas Swift, married a daughter of the poet and playwright Sir William Davenant, a godson of William Shakespeare. He is probably the foremost prose satirist in the English language, and is less well known for his poetry. Swift originally published all of his works under pseudonyms – such as Lemuel Gulliver, Isaac Bickerstaff, MB Drapier – or anonymously. He is also known for being a master of two styles of satire: the Horatian and Juvenalian styles. 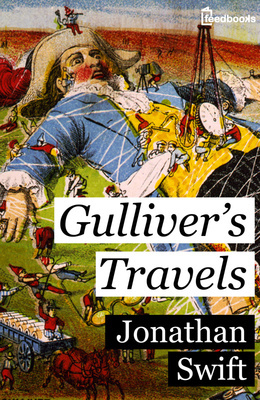 In 1726 he visited London, staying with his old friends Alexander Pope, John Arbuthnot and John Gay, who helped him arrange for the anonymous publication of Gulliver’s Travels in 1726 It was immediately successful and was translated into. French, German, and Dutch.Swift returned to England one more time in 1727 but The visit was cut short when Swift received word that Esther Johnson was dying and rushed back home to be with her. On 28 January 1728, Esther Johnson died. Sadly After this, Death became a frequent feature in Swift’s life. In 1731 he wrote Verses on the Death of Dr. Swift. In 1738 Swift began to show signs of illness, and in 1742 he may have suffered a stroke, losing the ability to speak. Following his death he was buried in his own cathedral by Esther Johnson’s side, in accordance with his wishes. The bulk of his fortune (twelve thousand pounds) was left to found a hospital for the mentally ill, which opened in 1757. There have also been many film Animation and Television adaptations made of of the novel. including the 1939 version, a Hallmark version starring Ted Danson as Lemuel Gulliver, and the most recent one starring Jack Black. He stopped teaching around the publication of The Ruby in the Smoke (1986), his second children’s book, whose Victorian setting is indicative of Pullman’s interest in that era. Pullman also taught part-time at Westminster College, Oxford, between 1988 and 1996, continuing to write children’s stories.Around 1993 He began writing the trilogy His Dark Materials, and Volume I, Northern Lights was published in 1995 (entitled The Golden Compass in the U.S., 1996). The next two novels in the trilogy, The Subtle Knife and The Amber Spyglass, soon followed. Northern Lights won the Carnegie Medal for children’s fiction in the UK in 1995. The Amber Spyglass was awarded both 2001 Whitbread Prize for best children’s book and the Whitbread Book of the Year prize in January 2002, For the 70th anniversary of the Medal it was named one of the top ten winning works by a panel, composing the ballot for a public election of the all-time favourite and became the first children’s book to receive that award. Northern Lights was also named the all-time “Carnegie of Carnegies” on 21 June 2007. 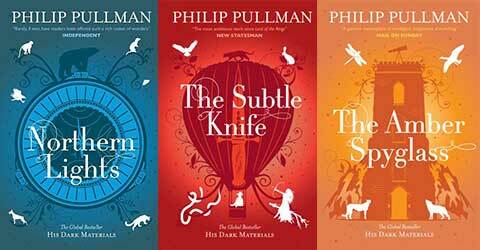 The series was also placed third in the BBC’s Big Read poll, and also won the Guardian Children’s Fiction Prize. On 23 November 2007, Pullman was made an honorary professor at Bangor University and In June 2008, he became a Fellow supporting the MA in Creative Writing at Oxford Brookes Universitys and In 2008, The Times also named Pullman one of the “50 greatest British writers since 1945″. Pullman later wrote two companion pieces to the trilogy, entitled Lyra’s Oxford, and Once Upon a Time in the North. A third companion piece Pullman refers to as the “green book” will expand upon his character Will. He has plans for one more, the as-yet-unpublished The Book of Dust. This book is not a continuation of the trilogy but will include characters and events from His Dark Materials, he is also writing “The Adventures of John Blake”, a story for the British children’s comic The DFC, with artist John Aggs. The Golden Compass was also adapted as a film starring Daniel Craig and Nicole Kidman, and the Ruby in the Smoke was adapted into a Television Drama starring Billie Piper. In October 2009, he became a patron of the Palestine Festival of Literature, and continues to deliver talks and writes occasionally for The Guardian. He was awarded a CBE in the New Year’s Honours list in 2004. He also co-judged the prestigious Christopher Tower Poetry Prize (awarded by Oxford University) in 2005 with Gillian Clarke. Pullman also began lecturing at a seminar in English at his alma mater, Exeter College, Oxford, in 2004, the same year that he was elected President of the Blake Society. In 2004 Pullman also guest-edited The Mays Anthology, a collection of new writing from students at the University of Oxford and University of Cambridge. In 2005 Pullman won the biggest prize in children’s literature, the Astrid Lindgren Memorial Award from the Swedish Arts Council, recognising his career contribution to “children’s and young adult literature in the broadest sense”. The first volume of Pullman’s new trilogy The Book of Dust is published on 19 October 2017. The as-yet-unnamed second title in “The Book of Dust” will include a character named after Nur Huda el-Wahabi, a 16-year-old victim of London’s tragic Grenfell Tower fire. Prolific English novelist John le Carré ( David John Moore Cornwell), was Born 19th October 1931. His formal schooling began at St Andrew’s Preparatory School, near Pangbourne, Berkshire, then continued at Sherborne School. From 1948 to 1949, he studied foreign languages at the University of Bern in Switzerland. In 1950 he joined the Intelligence Corps of the British Army garrisoned in Austria, working as a German language interrogator of people who crossed the Iron Curtain to the West.In 1952, he returned to England to study at Lincoln College, Oxford, where he worked covertly for the British Security Service, MI5, spying upon far-left groups for information about possible Soviet agents.in 1954, Cornwell quit Oxford to teach at a boys’ preparatory school; however, a year later, he returned to Oxford and graduated, in 1956, with a First Class Honours Bachelor of Arts degree. He then taught French and German at Eton College for two years, afterwards becoming an MI5 officer in 1958; he ran agents, conducted interrogations, tapped telephone lines, and effected break-ins. In 1964 le Carré won the Somerset Maugham Award, established to enable British writers younger than thirty-five to enrich their writing by spending time abroad.In 1990, he received the Helmerich Award which is presented annually by the Tulsa Library Trust. In 2008, The Times ranked Le Carré 22nd on its list of “The 50 greatest British writers since 1945″. In 2011, he won the Goethe Medal, a yearly prize given by the Goethe Institute.In 1998, he was awarded an Honorary Degree (Doctor of Letters) from the University of Bath, and In 2012, he was awarded the Degree of Doctor of Letters, honoris causa by the University of Oxford. Many of Le Carre’s novels have also been adapted for screen and television including Tinker,Tailer,soldier,spy, A Delicate Truth and A Most Wanted Man.